The Saturday Issue is a feature I created to showcase and review graphic novels. Source: Netgalley/Archaia Entertainment – I received this book in exchange for an honest review. I received no compensation. When I saw this I just knew I had to try it out. Jim Henson’s name carries a certain weight to me.I immediately think of the fun movies and shows from my childhood, and it reminds me of the quality of imagination and creativity involved.. The Storyteller is an anthology filled with folk tales from various parts of the world, each with a unique art style to accompany it. 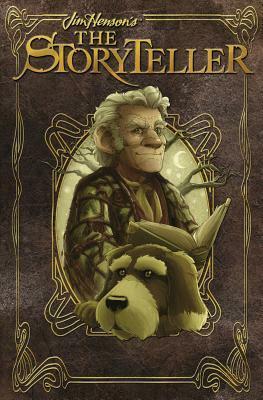 This is a really cute graphic novel that centers around the Storyteller, who likes to collect and tell all manner of stories, and his cute dog. There are 9 stories total. Some of the tales he tells are really well known and others are a bit more obscure or only well known in certain parts of the world. As I said before each story comes with it’s own art style that matches the story’s origin or ‘feel’. I really loved Puss in Boots and The Crane Wife, I already knew those stories but the art was really fitting and made the stories a bit more ‘fun’. I think this would be perfect for kids because this would be something I would have loved as a kid. I think the whole storyteller idea is brilliant because it becomes sort of interactive if a parent chooses to read it with their child. The Jim Henson company definitely hit the mark with this one, and I wouldn’t mind seeing more tales told like this. This entry was posted in Book Reviews (2013) and tagged 4 stars, children's, fantasy, graphic novel, review, saturday issue. Bookmark the permalink. Who doesn’t love Jim Henson? I mean he was the genius behind The Labyrinth. Probably one of my favorite movies of ALL time. 🙂 I will have to look into this one. Thanks for the review!